I had never heard about it until last week, but with the way things are going it’s probably a good idea to switch your default messenger. 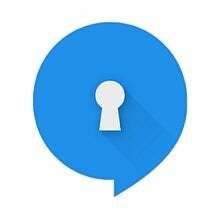 Signal is an encrypted end to end messenger app, which will scramble your messages and password protect them with a passphrase. And right now even a little peace of mind is worth downloading, especially if you are planning on getting involved in any activism work. It’s free and it’s on both iOS and Android, and the interface is actually pretty nice. It’s no surprise they saw a 400% boost after the election. Signal, which features end-to-end encryption, has seen 400 percent growth since the election. ETA: it is also available to link on desktop.